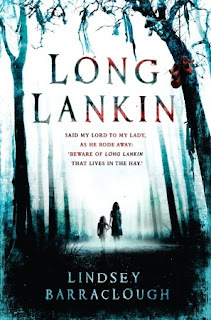 Long Lankin is a fantastic, post-war Britain ghost story, with undercurrents of M.R. James-style horror. Gosh, sounds a bit like description of wine. In some ways, Long Lankin in an atypical YA novel. First of all, two of the novel's narrators are twelve (maybe thirteen), which would suggest the novel is middle-grade (ie: for ages 9-12). However, the third narrator is probably somewhere near sixty, which suggests this isn't a novel for young people at all. Also, the narrative includes largeish sections of archaic documents, with suitably old-fashioned language and spelling and stories of adultery, etc. The novel is, however, an atmospheric, suspenseful YA read, driven by a great story. All these non-standard elements make it original and also, perhaps, appeal to readers of all ages. On to the story! Cora and her four-year-old sister Mimi are sent from their East London flat in 1958 to stay with their Aunt Ida in her crumbling ancestral home in the Essex marshes. While there, they befriend Roger and his family and set out to solve the mystery of why strange ghostly children appear in the nearby churchyard and why all the windows and doors of Guerdon Hall must be kept shut and locked at all times. It soon becomes clear that Mimi, Cora's little sister, is in grave danger. All three points of view are well drawn and Aunt Ida's is just as interesting as the children's because she knows much more than she wants to say about the history of Guerdon Hall and the nearby church. Interspersed with all this ghostliness are much less chilling elements of good old childhood fun - family life, making camps in the woods, riding bicycles, hanging out in an old pillar box left over from the war, running to the shop to get a sweet while one picks up Dettol or washing up powder for Mum. I've seen some readers complain that the novel begins slowly but I savoured all these details of childhood and post-war Britain. This is the era in which my parents were born and my grandparents lived, but I'm familiar with the narrative of boom and prosperity in North America. For that reason, it was fascinating to see a world in which bomb damage in London still hadn't been cleared and one might have to run over to the pub to make a telephone call. (It reminded me at times of BBC's Call the Midwife, which we are currently watching). Also, as in Sarah Waters's The Little Stranger, the post-war period offers a good opportunity for both ghost stories and discussions of class and social change. The slow build of atmosphere and the careful revelation of the story of Long Lankin are very effective in racheting up the suspense. At one point I felt viscerally, physically tense, waiting to find out what would happen to the characters I had grown to care for. This is a novel based on the ballad "Long Lankin", which is printed at the beginning of the book. Knowing the ballad makes the novel more chilling but doesn't give the plot away. Part of the fun of the novel is the way Barraclough works out elements of the ballad and places them in a sensible historical context. This method reminded me of Janet McNaughton's An Earthly Knight, a YA retelling of the ballad of Tam Lin. P.S. I love the cover - the misty obscurity, the looming trees, and the girls who look like they're actually from the 1950s. One of my pet peeves in the covers of historical novels are models who look much too modern! I came across your blog and learned that you live in Oxford. My company publishes an iPhone app consisting of self-guided walking tours in Oxford. However, these walking tours were compiled three years ago and some of the information may be out of date. We are looking for people who currently live in Oxford to review the tour content and give us feedback. Would you be interested in reviewing our walking tours in Oxford or posting a "Look for reviewers" announcement for us in your blog? We offer reward to people who send us feedback. The reviewers will receive gift codes for our iOS walking tours apps. Each gift code is good for a free walking tour iPhone app download, normally priced at US$4.99. We have walking tour apps covering all major cities in the world.